BOSTON (JTA) — Ownership of the country’s oldest synagogue and its valuable religious and ritual objects is being decided by a federal appeals court. The hearing of the case by a three-judge panel of the 1st U.S. Circuit Court of Appeals in Boston is the latest development in a closely watched legal battle pitting New York City’s Shearith Israel, the oldest Jewish congregation in the nation, against Congregation Jeshuat Israel, located in Newport, Rhode Island. 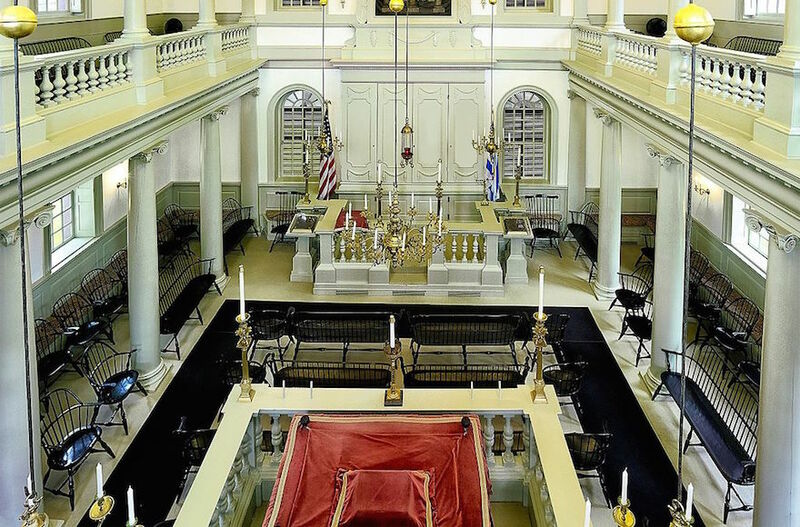 At stake is control of Newport’s 250-year-old Touro Synagogue, the religious home of Congregation Jeshuat Israel and a pair of historically significant silver bells that are used to adorn Torah scrolls. The bells, called rimonim, are late 18th century filials handcrafted by Myer Myers, one of the most prominent silversmiths of the Colonial era. The rimonim are valued at $7.4 million. The panel heard arguments last week in an appeal filed by Shearith Israel challenging a lower court ruling that held the Manhattan congregation is not the rightful owner of the synagogue, The Associated Press reported. Shearith Israel has served as trustee of the Touro Synagogue dating back to the early 19th century. Last May, U.S. District Court Judge Jack McConnell ruled in favor of Jeshuat Israel, granting it control of the Touro Synagogue, including its claim of ownership of the silver rimonim. In his decision that traced the history of the Newport Jewish community and its relationship with Shearith Israel, McConnell revoked Shearith Israel as the trustee and instead named Jeshuat Israel trustee of the building. But the appeals court panel seemed unpersuaded by the lower court decision and the arguments by the Touro Synagogue that relied on centuries-old events and history between the two congregations, according to the AP. ‘‘You keep going back to history, but we’re dubious it has anything to do with this case,’’ Judge Sandra Lynch told a lawyer for the Newport congregation, AP reported. Instead, Lynch referred to legal agreements from the 20th century that established Shearith Israel as the lessor of the building and the Newport congregation as the lessee. The panel also includes retired U.S. Supreme Court Justice David Souter, who occasionally sits as a judge on the court. The current dispute began in 2012, when Congregation Jeshuat Israel, which holds regular services at Touro, attempted to sell its valuable set of silver Torah bells to establish an endowment to maintain a rabbi and care for the building, which was designated a national historic site in 1946. Shearith Israel sued to stop the sale and attempted to evict the 120-family congregation from the building. The rimonim have been on loan from the Touro Synagogue to the Museum of Fine Arts in Boston, which had made an offer to purchase them. The museum has since rescinded its offer.